I have stumbled upon Easy68k, this looks like a great way to learn vanilla 68000 assembly language. OK so it's in Windows, but surely I'll learn the skills needed for achieving my goal of making a game for the Amiga 500. For starters it was very easy to install and it comes with some tutorials as well as examples on their website. The forum on their website is full of people in a similar boat of learning 68000. So already I've been reading up and now finally have a good environment to have a play about. I will try and share with you examples of my progress and I think this is a good starting point. I often find with tutorials and examples when learning technology that the basic stuff is REALLY basic, then all of a sudden the examples are so advance you struggle working out the steps involved. With that in mind, I wanted to share an example to move a blob about the screen using some user input, the keyboard. This covers drawing to the screen, and capturing key strokes. There is already a Snake type game called Pallet Eater in the examples which is great, but I just wanted to break a few things down. Simply draw a single red square, and the user can move up / down / left / right. That's it! I'm not an expert at assembly (yet), please let me know how I can improve my code. Any sort of hints and tips would be great. Also if there is a better way to share the code examples please let me know as the code will be getting a lot bigger! Write a game for the Amiga 500. Bonus goal would be for the same game to run on the Sega Mega Drive (Genesis), but I'll work that out once the first goal is achieved. I have an Amiga 500, and as mentioned before I'll be following the Amiga Format Bullfrog tutorials for writing a game in assembly language (I'll be writing separate blog posts for each tutorial). OK so tutorial 1 was pretty straight forward, very basic beginnings pretty much incrementing a register to move a sprite position and understanding some basics. I've had a quick flick through ahead of the future tutorials and it's pretty obvious that I'm going to have to do some extra research! Through those links I was able to download numerous pdf documents, text file tutorials and lots of other people discussing assembler. Great! Real world books I've ended up with, should keep me going for a while! OK so coding on the Amiga 500 is great, I have DevPac 2 and I can run simple examples. However, this is going to take forever! Not only is assembly language slow to code (especially when I'm learning), but one of the biggest draw backs is the lack of resources on the machine. As in, I can't just Google something and try it out. My Amiga 500 is on my desk and sits next to my laptop so yes I can Google stuff, but I have no way to transfer files across other than typing out line by line. What do I do? Ebay to the rescue again... I've purchased an Amiga 1200 (with a broken floppy drive - hopefully I will blog to explain how I will fix it). The great thing about the Amiga 1200 is that you can connect it to the internet, and also use a compact flash card as a hard drive!! 4Gb!! It's still in the post, but I expect I will try and code on the A1200 and once I'm up to speed I'll try and create boot disks with my tests and trials for the A500. Remember my goal is to write a game for the Amiga 500 not Amiga 1200! 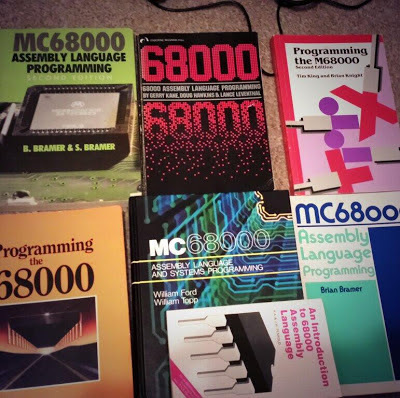 I've read through most of 2 68000 books, and I think it's becoming clear that I'm learning vanilla 68k assembly language. I need some Amiga specific references. I'm using DevPac 2, but maybe I need to get my hands of DevPac 3, AsmOne or some other assembler package? And then find a reference + tutorials for that package? I have stumbled upon Easy68k, this is an Editor, Assembler and Simulator for the 68000 that runs in Windows. Again this looks like just vanilla 68k, but looks like a great way to learn the basics without crashing my Amiga ever time! Do you still code in Assembler?! Would love to hear from anyone who still codes in assembler, especially for the Amiga machines. Or maybe if you used to? Any hints or tips you could recommend? OK so I'm a little late to the party (over 20 years), but I've set myself the goal to learn assembly language for the Amiga (68000 processors) and wanted to share my experience with you. At the age of 13 I was so excited to see a tutorial in Amiga Format called 'How to program your own games in assember', this was the stepping stone for me to become my dream, a games programmer. Sadly as a kid, I struggled, I already knew BASIC and AMOS, but Assembler was something else. The internet didn't exist, I was too young to realise there would be books on the topic, and didn't know anyone in the same boat I could share learning with. I was alone. I gave up, but it's always bugged me. Now I'm an experienced programmer, I became professional in the late 90's and my dream of coding games came true, but I never did learn assembly language. Of course I didn't need to, the industry moved on, easier and more productive languages are now used. Games I write for clients these days use Unity3D or XNA/MonoGame and the teams I work with can produce sophisticated 3D worlds. "Games ain't what they used to be"
Technology today is mind blowing, and the games produced today are masterpieces. However I still feel most games today miss the magic of the games made in the early 90's, especially on the Amiga. Is it just my age or did Amiga games really have something different about them? To prove I'm not wearing rose tinted glasses I've started to research some of the old classics. 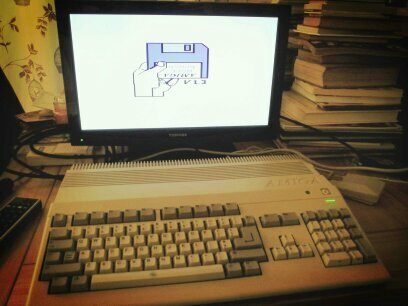 Google and youtube are great, but I've also fired up my Amiga 500 and properly reliving the experience. I wanted to understand more about the all round hero Amiga machine, and how the games were written. Whilst hunting through my old stuff, I came across my Amiga Formats (issues 39-44) with the tutorials I struggled with as a kid, I found all the cover disks, including the full version of DevPac 2. I'm about to learn assembly language, how hard can it be? Right? Game ON! Challenge accepted. I'm aiming to blog about my experience with each tutorial, and then hopefully sum up the whole journey. I have my Amiga 500 now set up on my desk, all issues of Amiga Format tutorial with all the cover disks (I hope they all still work). Can't wait to get stuck in to the tutorial I really hope it can teach me everything I need to know. Having new knowledge combined with my career experience, I would love to write a game for the Amiga! 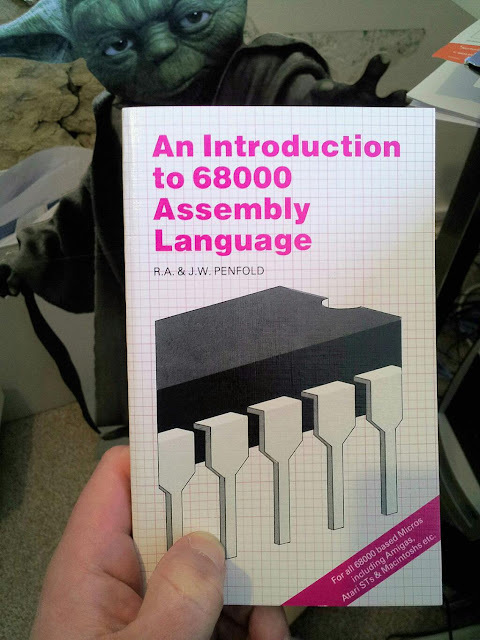 I've bought this book on Amazon 'An introduction to 68000 Assembly Language', it's very brief, but it does give me the list of commands available. Would love to hear from anyone who still codes in assembler, especially for the Amiga machines. Or maybe if you used to? Any hints or tips you could recommend? Did you complete the tutorials? Did it kick start your career?